Now completely FREE and with proper Windows Phone 8 support! TinyVNC – quick and powerful VNC client for Windows Phone. You need a VNC server (like Tight, Ultra, Real) on your computer to use a VNC client. Control your computer from your phone! TinyVNC connects to your PC and allows to see the desktop on your phone, control mouse and keyboard. Supports color depth from millions to grayscale - change it depending on your network speed. Supports different input methods: touchscreen, touchpad and touchpad without screen. In touchscreen mode you don't have a mouse, instead you control your desktop as if it had a touchscreen monitor. If you turn touchscreen mode off - you are in touchpad mode. It's like a touchpad on a laptop, but also shows the desktop. And finally you can turn off screen - this will greatly reduce traffic, and you will receive a simple remote touchpad. You can even play games using it! 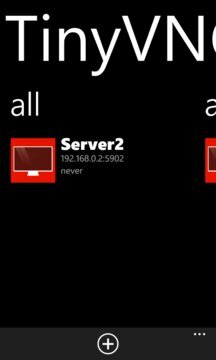 - pin predefined servers to start screen with live tiles! - supports portrait and landscape modes! - supports copy-paste between your phone and remote PC! - Supports RFB protocol 3.3, 3.7 and 3.8. Note: RealVNC has 4.0 version but its proprietary, encrypted and is not standardized. So if you are using it set the server to 3.8 (or 3.3) compatibility mode. - Supported authentication methods: None, VNC Auth. 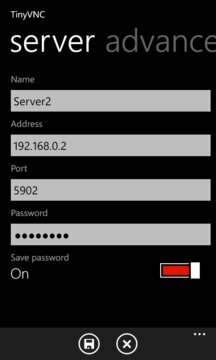 - Added Windows Phone 8 support.